I have subscribe for something only after complete research and analysis. I came across processexam.com when i was looking for good quality and professional online practice tests for ASQ Certified Manager of Quality / Organizational Excellence certification exam. I subscribed for the premium service after I received good scores in the final exams at first attempt. The payment is very safe and secure and is very low when compared to any test, available online or offline. I paid through my credit card and am very elated to choose Processexam. Hola Amigos! 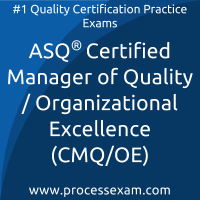 I am from Spain and received Very good scores in the ASQ Certified Manager of Quality/Organizational Excellence (CMQ/OE) Certification, all thanks to the site, processexam. I am very grateful to the site. It has so many plus points.